Thanksgiving wouldn’t be Thanksgiving without some sort of sweet potatoes! But did you know sweet potatoes are loaded with vitamins and nutrients. 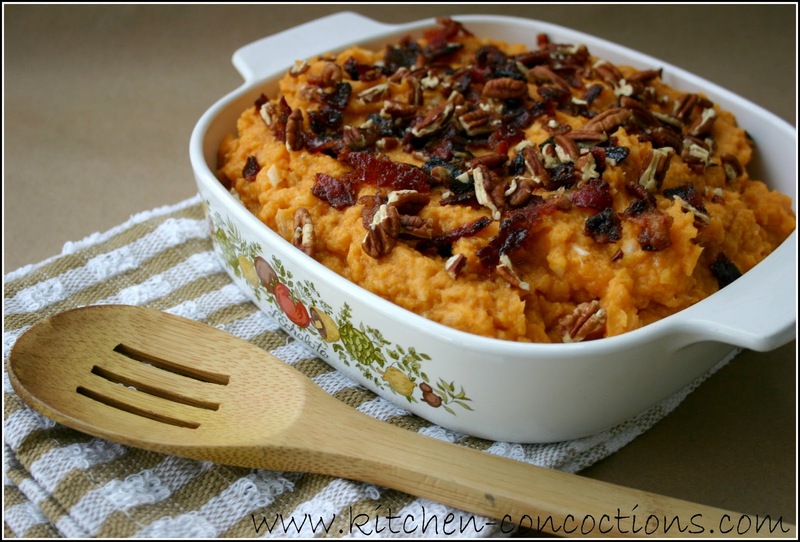 Well today as part of Thanksgiving week I have a luscious smashed sweet potato recipe. 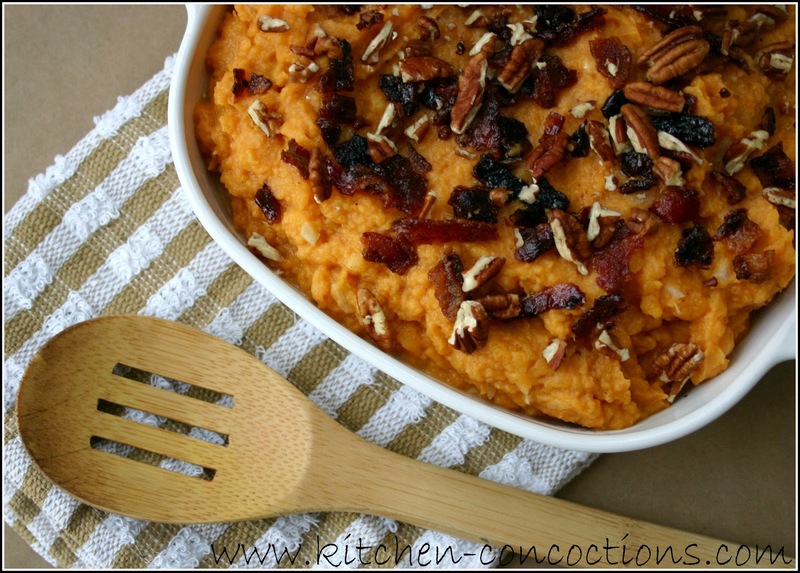 Eric calls them confused sweet potatoes because they are just slightly sweet but also savory with onions, garlic, and candied BACON. A beautiful paring if you ask me! I am also sharing some useful sweet potato facts in an article that I wrote for meal planning/recipe site Food on the Table; just in case you needed some cool facts to whip out at the Thanksgiving dinner table to impress your guests! LOL! Sweet potato hash. Sweet potato fries. And sweet potato pies. No matter how you choose to slice, dice or devour this succulent vegetable, sweet potatoes are a healthy and versatile food that aren’t just for Thanksgiving! Sweet potatoes are one of the oldest known vegetables and are native to Central America. They grow best in warmer, tropical climates and do not tolerate frosts or drought well. North Carolina leads sweet potato production in the United States; followed closely by California, Louisiana, and Mississippi. While these states produce sweet potatoes year round, they are at their peak from September through December. Sweet potatoes are an excellent source of Vitamins A, C, B6, manganese, fiber, potassium, beta carotene, and iron. They are a powerful anti-oxidant and studies have shown sweet potatoes are a top choice for fighting diseases such as cancer and heart disease; as well as helping maintain healthy blood sugar levels and reducing inflammation related to asthma, arthritis, and sore muscles. When selecting sweet potatoes, choose ones that are firm with no cracks, bruises, or soft spots. They should be stored in a cool, dark place where they will stay fresh for up to two weeks. Avoid refrigerating raw sweet potatoes, which will alter their flavor. Once cooked, sweet potatoes can be stored in the refrigerator for one week or frozen for four to six months. Due to their unique flavor, sweet potatoes lend to both savory and sweet cooking applications. Enjoy them baked in breads and desserts, transformed into fillings for pies and tarts, diced up and roasted, boiled and mashed, and even diced up and added into slow cooked casseroles, stews and chilies. These smashed sweet potatoes are a wonderful combination of sweet and savory flavors. For those days when you can’t make up your mind! LOL! Bring a large pot of water to a boil. Add sweet potatoes and boil 15 minutes or until soft. Meanwhile, place bacon on a foil lined baking sheet. Sprinkle with brown sugar and bake for 8-10 minutes or until crispy. Once cooked, crumble bacon into pieces. pumpkin pie spice, maple syrup, salt and pepper to drained potatoes. Using an electric mixer, mix potato mixture until smooth and all ingredients are mixed in. Serve topped with pecan pieces and bacon crumbles.